The research was supported in part by our members through the Committee’s annual budget, along with core funder RAC, major funders AECOM, ANZ and the City of Subiaco, and supporting funders Ipsos, UWA, Finbar and HASSELL. An extensive research agenda resulted in 13 major findings, 10 recommendations and 33 actions to guide investment and ensure that Perth is a mobile, liveable, vibrant and prosperous region for all. Outline community and business preferences and choices for Perth’s future mobility. Identify preferred solutions for the Perth region. Benchmark key solutions against current international best practice. Articulate a collaborative action plan and pathways for government, private and non-government organisations to deliver solutions that achieve a mobile future for the region. Marion Fulker, CEO, recently presented the recommendations of the Get a Move On! report and key findings of her recent bi-annual International Study Tour to the Roads Australia Journeys of the Future Forum. This Bulletin has been prepared as part of the Committee for Perth's Get a Move On! project. It analyses the relationship between transport, spatial form and economic growth in Sydney, Melbourne and Perth through the consolidation of information from recently published literature. It aims to identify the impacts of accessibility on the spatial structure of employment and the key strengths and weaknesses resulting from transport and urban form in each metropolis. These interviews were developed by Ipsos for the Committee for Perth for the Get a Move On! project. The Get a Move On! Business Interviews were conducted with 40 businesses and 2 Local Government Workshops to find out the impact of congestion on business and the impact of business location. This Bulletin examines the evolution of strategic land use and transport planning for the Perth and Peel regions from 1955 to 2015. It has been produced as part of the Committee for Perth’s Get a Move On! project, which delivers a comprehensive analysis of land use and transport in the Perth and Peel region and provides recommendations for the future. This Bulletin is part of the Committee for Perth’s Get a Move On! project. The report examines the job skills matching within metropolitan sub-regions by mapping where people live and where they work. This Bulletin has been prepared as part of the Committee for Perth’s Get a Move On! project, which delivers a comprehensive analysis of land use and transport in the Perth and Peel region and provided recommendations for the future. The latest FACTBase 48 Bulletin is part of the Committee for Perth’s Get a Move On! project. The report examines the impacts of employment decentralisation and types of spatial organisation on commuting distances, patterns and travel times. Since the 1970’s, successive strategic plans have attempted to decentralise economic activity and encourage businesses to locate themselves out of Perth’s CBD in an effort to reduce commuting issues and increase employment opportunities across the region. This FACTBase Bulletin examines interregional commuting across Perth and Peel, including the large fly-in fly-out workforce living in the metropolitan area and working in regional Western Australia. The latest FACTBase report released by the Committee for Perth reveals that despite decades of strategic activity centres being created across the Perth and Peel regions, the city still remains the number one destination for workers. The Committee for Perth officially launched Get a Move On! – a year-long research project that will be the first comprehensive study that asks Perth commuters and the business community what kind of practical, long-term public transport system they want. 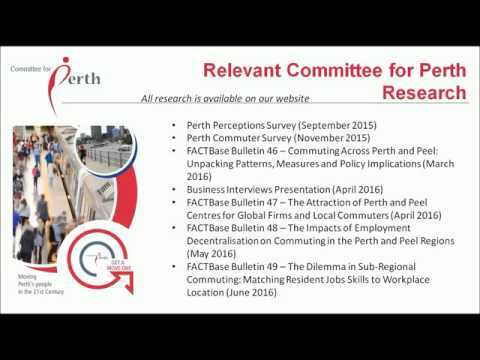 ​This presentation highlights the outcomes from the recent Perth Perception Survey undertaken by the Committee for Perth. Introducing Get a Move On! - the Committee for Perth's landmark study aiming to establish a definitive evidence base to underpin new, integrated and innovative strategies for the efficient movement of people across the Perth and Peel region in the 21st century. This Perth in Focus luncheon featured a keynote address from UK Professor Jon Shaw, co-author of ‘The Transport Debate’. 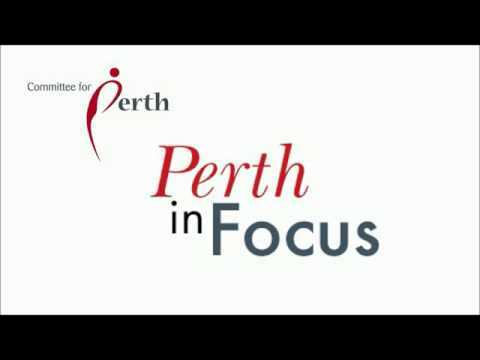 This Perth in Focus luncheon featured the CEO of Infrastructure Australia, Philip Davies, who has over 25 years of experience in shaping policy, delivering nationally significant infrastructure projects and leading reform. Philip discussed in more detail, the Audit, the Plan and the re-invigorated Infrastructure Priority List. Sally Braidwood from IPSOS also released the key findings from the Business Interviews conducted as part of the Get a Move On! project. At this luncheon Sally Braidwood from Ipsos presented the first insights into the Get a Move On! 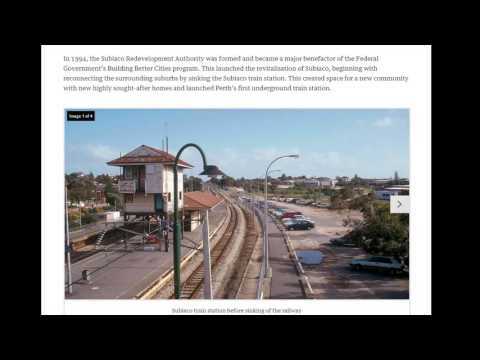 project, the Perth Commuter Survey.